Most railroads would have a ‘maintenance of way’ team, whose job it was to maintain the track of their railroad. Whilst the big train companies would have purpose built equipment to achieve this, the smaller private industrial lines would cobble together what they needed from what they had. The Campbell Lumber Company MoW train is no different. Pulling this train today is loco number 8, a well-worn Gas-Mechanical, rather than its usually 0-4-0 Porter number 1 which is in the shop for routine repairs (actually its sat in its box waiting for detailing, but ‘routine repairs’ sounds better). Number 8 is an early Bachmann Gas-Mechanical that I had to fit a chip to (the newer ones had it pre-installed), detailed with a Backwoods Miniatures dress up kit. A full article on detailing this loco is on the Group website if you are interested. 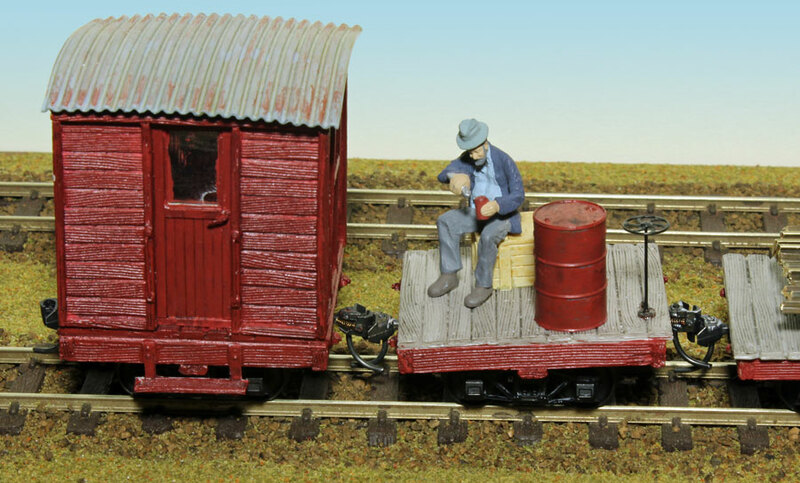 The tank car is also from Backwoods Miniatures, one of their resin ‘select-a-car’ range. These cars are available in a variety of builds, from basic flat cars to snowploughs and cranes, but be warned that due to manufacturing costs you have to buy at least 3 at a time. The car was built as standard, and then I added to it a tap and bucket from S&D models and a brake wheel set from Grandt Line, and Kadee couplers. 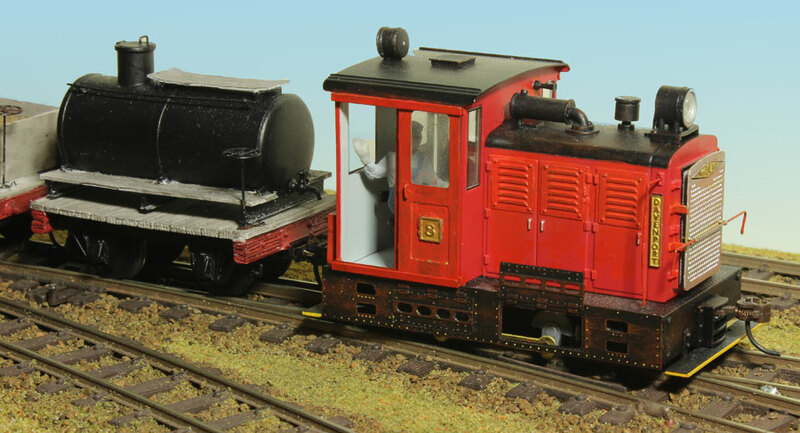 The ballast and sand cars are both resin kits from Boulder Valley Models. BVM produce an extensive range of rolling stock and loco conversion kits in resin, at a high quality and comparatively low price. These two cars, and the rest in the train, are from their ‘4 wheel car’ range. The cars come in packs of 2, with you just having to add couplers, trucks and any additional detail (such as brake wheels etc), with a deck about 7 scale feet square. These 2 cars are listed as ‘ore cars’ and again are built as the instructions. Each then had a load added directly in to it – the shallow depth and not wanting to empty them negating the need for adding a remove ‘platform’ as a base for the load. The ballast is the ballast used on my Silver Creek layout, a mix of fine and medium grade brown Woodland Scenics ballast. The sand is sand for my scenic materials, bought at a previous FebEx. The tool car, as the rest of train, is also a BVM 4 wheels car. This started out as a flat car, with sides added from scale timber to match the ore cars. The oil drums are Grandt line, as are the spike containers. The other details are from various sources, just to add to the general clutter. The tie car is just another BVM flat, with a simple load of stained scale lumber, cut to represent ties (sleepers). It took a bit of searching (and some funny looks in Hobbycraft) to find scale lumber that matched Peco’s On30 sleepers, but it looks quite good. The rail load is sitting on a set of BVM logging disconnects. These come as a pair, but are designed to be coupled together directly, which looked too close for carrying sensible lengths of rail. To get around this, I replaced the mating pair of couplers with link and pin mounts from Grandt line, then fashioned a short piece of rail to go between them, this is held at either end by the pin of the link and pin. The last BVM flat car is just some general clutter, with the addition of a figure, having his lunch – its must be some reasonably good track sections it’s riding on. Finally bringing up the rear is a small caboose, again a BVM 4 wheel car. The caboose comes either as a pair, or a single and a flat car. The shed part is also available on a proper flat car for a ‘workboose’, which you may have seen on Silver Creek. Again the car is built as normal, but with the addition of a couple of M10 nuts super glued to the floor inside to add weight. This is important in the caboose, as it is the one most likely to be uncoupled, and as these wagons are small and light they have a tendency to de-rail when manually uncoupling – the extra weight here seems to help. All the cars are finished in a similar paint scheme, with a red underframe and grey deck, which is then covered with a black wash to highlight the grain detail and dirty them up some. Various light weathering is then done with rust on the metal surfaces, and dirt and grime elsewhere. Trucks are painted black and also rust weathered. All paints used are from the Citadel Miniatures range, stocked at Games Workshop and their stockists, included Alton Model Centre. This article originally appeared in the FebEx2015 Programme. Paul Joel became the first junior member of the Group in 1987, having been tagging along with his father Roger Joel since it began. Paul is a current and founding member of the Group's American Section, and has his own exhibition American Narrow Gauge layout 'SIlver Creek'. He is also interested in British Great Western.